Thermoplastic Polyolefin or TPO is a single-ply roofing material made of ethylene propylene rubber. TPO roofing is the fastest growing category of single-ply systems because more and more roofers in Lower Mainland and Fraser Valley use it for its environmentally friendly qualities. TPO roofs have excellent heat reflective properties and are ENERGY STAR rated®. The Cool Roof Rating Council also considers it a cool roof, which means that it helps keep your home’s interior cool. TPO roofs reflect the sun’s UV rays. This reduces the load on your utility systems, leading to likewise reduced energy consumption and increased savings. In addition, TPO roofs are 100% recyclable at the end of their life span. TPO roofing systems resist algae, dirt, debris, and bacteria build up and withstand harmful ultraviolet, ozone, and chemical exposure. They are durable and resistant to punctures, tears, and impact damage as well. Firestone provides several different TPO roofing systems depending on your needs. As experts in roof installation and roof repair in Lower Mainland and Fraser Valley, we can easily help you determine which system is the best option for your home’s roof. UltraPly™ TPO exceeds ENERGY STAR requirements and delivers long lasting performance. It has excellent wind uplift resistance and has superior durability and strength. The UltraPly Platinum TPO system delivers comparable performance with its 80-mil thick reinforced membrane. Firestone also backs it with an exceptional 30-year warranty coverage. Multiple types of Platinum warranties are also available, so you can choose between coverage for puncture, puncture/hail, and puncture/hail/wind. UtraPly TPO XR combines the durability of a single-ply membrane with an eight-ounce nonwoven polyester fleece. This reinforces the material, enhancing puncture resistance. We can install the UtraPly TPO XR system through several different methods, making it especially efficient for large areas. This option is ideally suited for reroof applications and new construction. Firestone designed the UltraPly™ TPO SA with the NEW Secure Bond™ Technology to be the next generation in fully adhered roof system application. 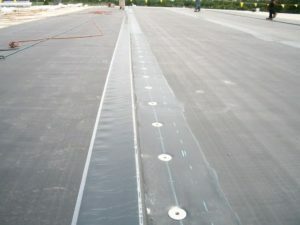 This membrane saves you both time and money because it requires no bonding adhesives or extra drying time. When applied by professionals like us, it will have virtually no wrinkling and will install up to five times faster. Lastly, it is environmentally friendly, has zero Volatile Organic Compounds, and emits no odor. A Firestone TPO roofing system installed by us will protect your home for many years to come. Firestone has fully trained and certified Direct Roofing in the installation and maintenance of their products, giving us the skills to work with virtually any kind of roof. Give us a call at 778-552-ROOF to learn more about Firestone TPO roofing systems or to get a free estimate. UltraPly TPO is highly resistant to tears, impacts, and punctures yet remains flexible to allow for building movement – it is available in 3 different thicknesses, 0.045”, 0.060”, and 0.080”. TPO can be installed on low and high slope surfaces and can be heated and reshaped multiple times, which is particularly helpful when completing roof details. UltraPly TPO’s flexibility allows for a rapid installation and requires little maintenance throughout its life. TPO membranes are commonly fully adhered or mechanically attached to the underlying insulation or cover board. Firestone UltraPly TPO membranes are available in rolls ranging from 5’ x 100’ to 12.4’ x 200 which reduce number of seams and cut labour costs drastically. A light coloured roof that reflects the sun’s energy can play a significant role in reducing the buildings cooling costs. It also offers benefits to the surrounding environment through a reduction of the urban heat island (UHI) effect. TPO membranes are heat-welded at 926ºC with a hot-air gun. The result is a fused seam that’s stronger than the field of the membrane. TPO membranes contain no toxic or hazardous ingredients and are fully recyclable.